Democratic poll-watchers were having a pretty good Monday. Rasmussen Reports had shown Republicans with a relatively small 3-point advantage on the generic ballot — the narrowest advantage that Rasmussen has shown for Republicans in about a year. Meanwhile, two polls in a pivotal Senate race, Connecticut, showed the Democrat Richard Blumenthal with a solid lead there. Perhaps there was something to all the talk about a Democratic rebound in the polls, which has been in fashion lately. But then at about 5:45 p.m., this poll — Gallup’s weekly tracking of the generic ballot — hit the newswires. The poll gave Republicans a 3-point edge among registered voters — well within the range that Gallup has shown in recent weeks. But Gallup also introduced its likely voter model this week, and there, Republicans’ advantage was much larger: 13 points under one scenario — what Gallup calls a “higher turnout” scenario — and 18 points in another, “lower turnout” version of the model. Those are absolutely terrifying numbers for Democrats. Although it’s not completely straightforward to translate the generic ballot into actual votes, were Democrats to lose the House popular vote by anything resembling that margin, their losses could be catastrophic. According to one formula that models turnover in the House based on the Gallup likely voter model specifically, a 13-point lead for the G.O.P. would translate into a gain of 71 (!) seats — and an 18-point, lead, a gain of 86 (!!) seats. Our version of a House forecasting model, which uses both Gallup and other generic ballot polls, as well as a whole host of other inputs, suggests that such gains by the Republicans are theoretically possible — but rather unlikely. As of our last forecasting run, the model had given Republicans about a 1-in-15 chance of a gain of as large as 71 seats, and a 1-in-200 chance of a gain of 86 seats or more. Gallup’s “higher turnout” model shows a 10-point gap between the preferences of registered and likely voters (a 3-point advantage for Republicans among registered voters becomes 13 points among those more likely to vote). Their “lower turnout” model, meanwhile, shows a 15-point gap. How do these numbers compare to what other pollsters are showing? I’m fond of pollsters who publish results among both registered and likely voters. Among other things, it provides valuable information for our forecasting model, which builds in an adjustment to “translate” the results of registered voter polls into likely voter terms. The process by which the model does this is slightly complicated, but in recent weeks, it had been showing a gap of around 4 or 5 points in the Republicans’ favor between the two types of surveys, and had been giving Republicans a “bonus” for that reason. This gap, however, may vary significantly from polling firm to polling firm. Just this past weekend, for instance, a Newsweek poll showed Democrats 5 points ahead among registered voters — already a good number for them — but with a larger lead of 8 points among likely voters (Newsweek calls them “definite voters”, but it’s basically the same thing ). That is, it showed a 3-point likely voter gap in the Democrats’ favor. By contrast, as we noted, the Gallup poll shows as much as a 15-point swing in Republicans’ favor when a likely voter model is applied. Regular readers of this blog will not be surprised to learn that the results that most other pollsters are showing lies somewhere in between these two extremes. 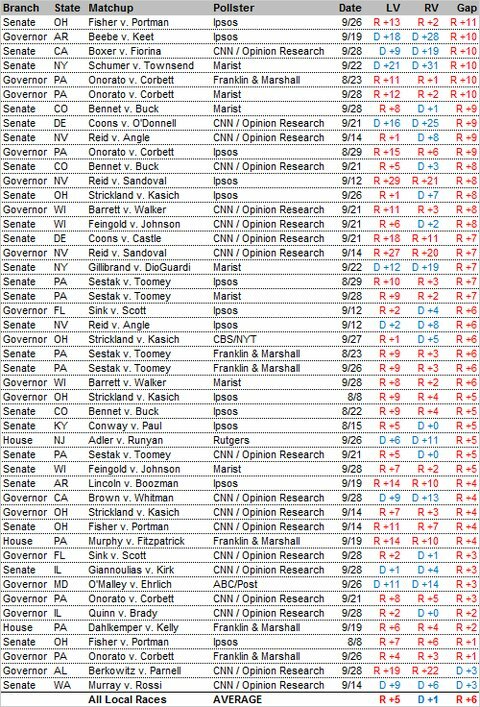 Below, I’ve listed every generic ballot poll since Aug. 1 — other than Gallup’s and Newsweek’s — which published results among both registered and likely voters. These polls have shown Republicans, on average, ahead by 2 points among registered voters but 8 points among likely ones: a 6-point gap. Gallup’s “high turnout” model, which shows a 10-point gap, is not a huge outlier — other pollsters had shown numbers in the same range — although it is toward the high end of the range. Their “low turnout” model, on the other hand, with its 15-point gap, is pretty far out there — and so of course is Newsweek’s poll, with its 3-point Democratic edge. We also keep track of polls that do this at the state and local level, and they show pretty much the same numbers. In 45 of 47 state and local polls since Aug. 1, the Republican did better on the likely voter version of the survey than the registered voter one. But in no case was the gap larger than 11 points, and it averaged 6 points. So, that 6-point edge is not really very different from the 4- or 5-point gap that our model has been anticipating for a few months. Now that we have enough polls showing direct head-to-head comparisons between the two types of voter universes, I may change (i.e. simplify) the procedure that our model uses. But since most pollsters at the state and local level switched over to likely voter models some time ago, this will not make much difference in our overall forecasts. We could also get into a discussion about why Gallup shows a larger gap than other pollsters — I had some thoughts about the Gallup likely voter model here and Mark Blumenthal does here. But frankly, I don’t think these sorts of conversations are all that interesting, because the conclusion always winds up being the same: the differences result from some combination of statistical noise (Gallup’s likely voter model has some reputation for being fairly noisy), and legitimate differences of opinion about how to model the electorate. History tells us that when you have a sufficient number of polls — which we do in the case of the generic ballot — you’re best off simply taking an average and staying focused on the big picture. The big picture is that Republicans are poised to have a very good November — but exactly how good, we’re all kind of guessing at. I would note, however, that this is exactly why you don’t want to base your model on just one indicator –like Gallup’s likely voter model at the exclusion of all others (or Newsweek’s, for that matter) — when many other relevant types of information are available. Gallup’s model could be right: it is one of the finest polling organizations on Earth, and its likely voter model has a good track record in past midterm cycles. But the results it is showing diverge quite a lot from the consensus of generic ballot polls (moreover, the average of generic ballot diverges somewhat from several other useful indicators, like local polls). Trading markets on the likelihood of a Republican takeover of the House, which are going to do a more robust job of incorporating different types of information than a one- or two-factor model would, were essentially unchanged on the release of both the Newsweek and the Gallup polls, which is probably the most appropriate response.